Season 3 : Episode 13 Part II – Did we fail? Stop! If you haven’t listened to the latest Special, Two Gomers’ Life Lessons, do it before listening to this episode! Download here! It’s the Season 3 finale, and it’s a doozy. While there are plenty of chances to tangentize (which they do, and we learn the true definition of “amateur” because of it), the guys focus their attention on one topic: What to do with the fact that their goal, publicized in the title of this months-long season, went unmet. Other questions inevitably follow: Will they ever do this again? How does one motivate oneself to keep going? Can you learn from failure? Was it failure at all? Why God? And of course: Who am I?! Steven gave a VHS copy of this movie to Anthony for a groomsman present. True story. Also, the guys share several final Songs to Run To (and Songs They Ran To), spend some time looking back at this season and seasons past, and start the inevitable conversation of What’s Next? From the Gomers to the Gomernation, thank you for joining us this season. Have a great summer, stay cool, never change, BFFs forever…and Happy Running! P.S. A quick message about shirts at the end! 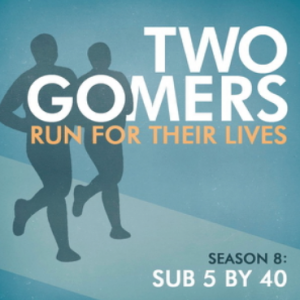 Previous PostSeason 3 : A Special Gomernouncement: The 2nd Annual Gomer Group Run!Next PostSeason 3.5 : Gomer Extra – Try to find the announcement among the tangents! Dudes no way did you fail. You finished and faced yourself. Anyone who undertakes running and commits to training for a marathon can be proud. Listening to you talk about the angst of getting close to your goal and not quite reaching it. I am writing before listening to your final episode, so I am not swayed. Having suffered not reaching my goal,I seriuously choked listening to your description. Keep at it, life is grand. No! You didn’t. Congratulations on all your progress and all your discipline. I can’t imagine going that distance. You guys give me lots of running motivation/inspiration. Anthony, you inspired me today: I’m going to hit the etude books this summer. Thanks for that. Thanks for the great season– you helped me through many a run. This episode in particular might have kept me, a clearly unrealistically goal oriented runner from injuring myself before the Twin Cites Metronic Marathon, this Oct. I wrote a blog post about it and mentioned you guys. Looking forward to hearing about your future strives! Thank you! The final episode is helping me along in my own race reflection and shades of disappointment. It’s tough to go to work and realize how much no one else really cares about your running goals while it’s eating you up inside. You guys put into words the self-reflective obsessive angst I’ve experienced since my marathon. I had to write down that quote about the HARD being what makes it GREAT. Happy Summer!